The Carter Center staff are mission-driven professionals committed to making an impact to advancing peace and health worldwide. In accordance with our commitment to fundamental human rights, The Carter Center embraces diversity as an organizational strength and source of enrichment. We value free and open communication, respecting the views, roles, and contributions of all. There are approximately 200 staff at the Atlanta headquarters and thousands more in field offices around the world. 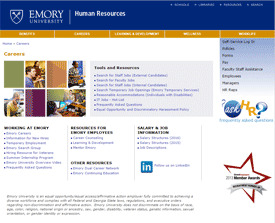 Atlanta staff are recruited through the Emory University Human Resources Department and are employees of Emory University. We offer competitive compensation and a comprehensive benefits program to meet the diverse needs of our staff. Below are just a few of the many benefits available. To see all of the benefits Emory offers, visit the Benefits webpage. A complete list of Carter Center position openings can be viewed on Emory University's Career Opportunities. If you don't see a position that you are interested in, please submit your resume for future consideration to careers@cartercenter.org. We will certainly keep you in mind and contact you if a position becomes available that matches your background. Founded in 1982 by former U.S. President Jimmy Carter and his wife Rosalynn in partnership with Emory University, The Carter Center was created to advance peace and health worldwide. Based in Atlanta, Georgia, The Carter Center is guided by a fundamental commitment to human rights and the alleviation of human suffering. The Center seeks to actively prevent and resolve conflicts, enhance freedom and democracy, and improve health. As a nongovernmental organization, the Center has helped to improve life for people in more than 80 countries by resolving conflicts; advancing democracy, human rights, and economic opportunity; preventing diseases and improving mental health care. The Carter Center collaborates with other organizations, public or private, in carrying out its mission around the world. For additional information regarding accomplishments, leadership, governance, and current programs, please visit The Carter Center. 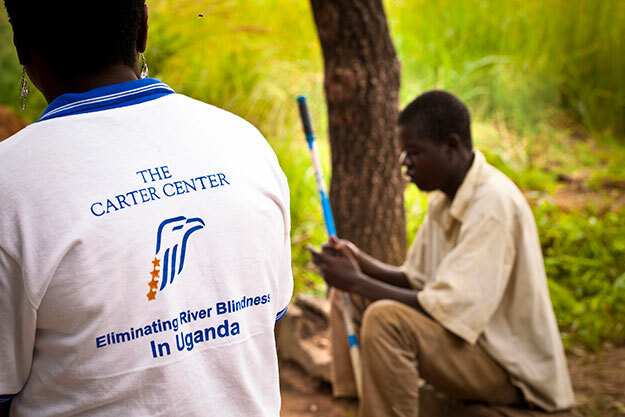 The Carter Center is recognized as a pioneer and leader in the field of election observation. It has monitored 107 elections in 39 countries, helping to ensure democratic elections that reflect the will of the people. When the Center first started observing elections in the late 1980s, the Cold War was ending and a wave of democratization was spreading globally. In the last 10 years, however, the trend toward greater democracy has plateaued, and citizens in many parts of the globe are now confronting challenges from authoritarian governments and narrowing political space. Beyond elections, the Center seeks to deepen democracy by nurturing full citizen participation in public policy-making and by helping to establish government institutions that bolster the rule of law, fair administration of justice, access to information, and government transparency. A culture of respect for human rights is crucial to permanent peace. The Center supports the efforts of human rights activists at the grass roots, while also working to advance national and international human rights laws that uphold the dignity and worth of each individual. When democracy backslides or formal diplomacy fails, the Center offers conflict resolution expertise and has furthered avenues for peace in Africa, the Middle East, Latin America, and Asia. Since 1982, The Carter Center has shown that creating a world at peace is a very possible journey, one step at a time. The VP, Peace Programs is required to have broad experience and deep substantive knowledge of international affairs and is a respected expert with a minimum of 10 years of relevant professional experience at a senior leadership level, and a graduate degree in a relevant field. A terminal degree is desirable, as is proficiency in one or more foreign languages and experience working and/or living abroad. The successful candidate will be a decisive manager with a proven track record of managing and leading successful global teams, strong managerial and leadership skills, and proven ability to oversee complex international multi-disciplinary initiatives simultaneously. Extensive international experience in one or more of the following geographic areas is also required: Africa, Central America, South America, the Caribbean, the Middle East, or Asia. The successful candidate will have a record of distinguished service as a practitioner, ideally in a variety of organizational settings (e.g. international/multinational organizations, government, non-governmental organizations, academia, and/or independent consulting). The ability to shape and implement the strategic vision for The Carter Center Peace Programs is a critical element for this position, as is the ability to effectively communicate with internal and external stakeholders. The successful candidate must exhibit leadership qualities to build accountable teams and manage change. The Carter Center's Global Access to Information (ATI) Program works in partnership with governments, civil society, and international and regional bodies to improve governance and transform lives through a meaningful right of access to information. Serving as the deputy to the Director, the Senior Associate Director oversees the implementation of the Global Access to Information Program’s country programming portfolio. The Senior Associate Director’s primary responsibilities include: all aspects of project management (design, implementation, and evaluation), fundraising, budget and grant management, staff supervision, and liaising with both Carter Center program and department personnel and external stakeholders. The Senior Associate Director supports the Program Director in setting overall strategy and assures that projects align with the program mission. -Proven expertise in the field of access to information, transparency, democratic development, or good governance is required. -Post-graduate degree and at least ten (10) years related experience in international relations, political science, public policy, gender programming, human rights, good governance, and/or law. -Exceptional written and communication skills. -Candidates should be detail-oriented, well-organized, and able to independently manage multiple projects and lead teams. -A positive attitude and ability to work in a fun, fast-paced environment is essential. -Strong knowledge of NGOs and project-based fundraising and prior living/working experience abroad is a plus. -High level of proficiency in Spanish is preferred. -Assumes a senior role in the planning, development, and implementation of various aspects of a complex global program. -Serves as a liaison and key spokesperson to various committees and organizations. -Leads policy formulation, strategy development, and management of daily operations. -Collaborates with representatives from private, government, and international agencies to design, implement and/or evaluate program-related projects and strategies that effectively address the public needs associated with the program. -Conducts research, designs new initiatives, and writes publishable articles and papers. -May write grant proposals, and prepare/present associated reports to funding organizations and to clients. -May engage in fundraising initiatives on behalf of the program. -May oversee the annual budget and other financial aspects of the program. -Performs related responsibilities as required. Master's degree in a field related to the program and seven years of professional experience related to the program and previous supervisory and program/project management experience, or equivalent combination of experience, education, and training. Reporting to the Chief Development Officer, Major Gifts and Annual Fund (CDO), the Senior Associate Director, Annual Fund is charged with development and implementation of strategies for cultivation and solicitation of individual donors to the Annual Fund at The Carter Center. S/He is responsible for all aspects of the annual fund marketing program known as the Ambassadors Circle, a level of giving for donors making unrestricted gifts of $1,000 + annually. This may include marketing, budget and revenue management, communications, development and implementation of strategies, and event planning for solicitation and cultivation of members of the Ambassadors Circle, with the goals of generation, retention and growth of donors' giving. Provides exceptional level of donor-focused service, including timely and appropriate follow-up to receipt of gifts and donor visits The Senior Associate Director, Annual Fund is further responsible for analysis, planning, and management of the Annual Fund revenues and expenditures. S/he supervises professional and administrative staff. S/he also serves as a member of the Center's major gifts and annual fund teams, and contributes to the development of plans and strategies to achieve revenue goals in support of the Center's health and peace programs and overall operations. S/he also manages a tailored portfolio of individual donors. The position requires travel up to 40 percent of time to achieve cultivation, stewardship, and revenue targets. -Proven experience managing non-profit fundraising, with a focus on developing strategy and implementing annual giving programs including direct solicitation experience. -Strong interpersonal and long-term relationship-building skills are essential. -A disciplined, results-oriented self-starter who can work both independently and collaboratively in a fluid environment. -Well-developed analytic, strategic, critical, and problem-solving skills. -Excellent project management skills - ability to take lead on multi-functional projects, manage and prioritize multiple responsibilities and competing demands, and adapt to frequent and unexpected changes. -Strong attention to detail and able to develop, implement, and analyze strategies with minimal oversight. -Strong communication skills (written, oral, and presentation) to effectively articulate the mission and goals of The Carter Center and its programs in a compelling manner. -High degree of competency with Microsoft Office software and Raiser’s Edge constituent management system a plus. -Active engagement in professional development and current on best practices for annual fund programs. -Familiarity with planned giving vehicles. -Develops, coordinates, and implements fund-raising activities which may include direct mail, planned giving, endowment campaign and/or special fund-raising initiatives. -Maintains a thorough working knowledge of programs. Develops and implements strategies for marketing new and existing programs. -Manages fund-raising initiatives for specific programs, which may be funded by foundations, corporations, governments (foreign and U.S.), organizations or individuals. -Assists in preparing budgets, monitoring expenditures and preparing financial reports. -Builds relationships with current and prospective donors. -Maintains updated information on prospective donors. -Oversees the development of communication materials directed at donors. -Designs and implements strategies for cultivation, solicitation, and stewardship. -Evaluates the effectiveness of various development strategies, and prepares alternative approaches to meet goals. -Plans cultivation and solicitation trips. -Prepares briefing materials for trips and ensures comprehensive follow-up after donor visits. -May identify foundation support opportunities. -May write or assist others in writing grant proposals. -Ensures timely submission of proposals/reports. -May develop and make presentations; may write and present speeches. -Supervises staff, volunteers, and vendors. Bachelor's degree and four years experience in higher education, development, fund raising or equivalent experience in a non-profit institution. The Associate Director, Donor Services, is responsible for supervising on-site personnel and an off-site caging vendor who maintain donor records in support of high-volume fundraising activities and fulfill donor record requests. This position advocates for a positive donor experience and oversees data quality control and security compliance measures. During times of high volume, assists with data entry, answering phone calls and emails, and sending gift acknowledgment letters. Reports to Chief Development Officer, Direct Marketing. • Candidate must have five years of experience in overseeing donor services or customer service at a development office, inbound call center, or caging operation. • Experience managing personnel and vendors. Strong expertise working with donor databases (e.g. DMI and/or Raiser’s Edge), Excel, and Adobe Acrobat. • Strong computer skills, including facility with Microsoft Word, Excel, and PowerPoint. • Advanced knowledge of business process management and data quality control processes. • Strong collaborative problem solving and analytical skills and ability to manage a team are essential. • Applicant should be detail oriented, highly organized, and able to meet tight deadlines. • Must enjoy working with people and be energized by the Carter Center’s non-profit mission. • Oversees alumni solicitation and relations, major annual fund raising, donor acquisition programs, and public relations. • Plans and coordinates special events and fund raising projects. • Develops strategies for marketing new and existing programs. • Researches donor histories and solicitation strategies. • Writes and edits proposals and other promotional materials. • Plans, administers, and monitors the department's budget. • Designs and generates reports. • Performs related responsibilities as required. Bachelor's degree and three years experience in higher education, development, fund raising, or a related field. The Associate Director for Direct Mail is responsible for conceptualizing, planning, implementing, and managing the direct mail fundraising activities of the Development Department. This position carries a high level of importance to the financial well being of The Carter Center. Reports to Chief Development Officer (CDO), Direct Marketing. • Five or more years experience managing direct mail campaigns at a non-profit or on behalf of non-profit clients at a marketing agency. • Advanced knowledge of CRM systems or donor databases, including DMI. • Detail oriented, highly organized, and able to meet tight deadlines. • Must be a team player and energized by the Carter Center’s non-profit mission. • Effective written and oral presentation skills are necessary. • Advanced proficiency with Microsoft Office, Excel, and Powerpoint is a plus. The Associate Director (AD) will assist with the end stage of the GWEPs in Chad and Mali, and possibly other countries as necessary. The AD will be based at headquarters and will assist the national eradication programs 1) maintain the frequency and quality of supervision of regional and district program officers and field staff in areas under active surveillance in efforts to interrupt transmission of GWs, and 2) assess and assist with the monitoring and evaluation of GWEP teams charged with assessing levels of cash reward awareness, including the promptness and quality of the national surveillance system in responding to investigations of rumors of possible cases and the outcomes of those investigations. The Director, Senior Associate Director, Guinea Worm Eradication, and the Vice President for Health Programs are the primary providers of direction and guidance concerning priorities and action steps to be implemented regarding the eradication of Guinea worm. The AD also works in coordination with The Carter Center's Country Representatives (CRs). The position requires 75% international travel. Masters degree in a field related to the program(s) and five years of program related experience, OR equivalent combination of experience, education, and training. A candidate must be proficient in French. A candidate would be preferred with a proven ability to work successfully in sub-Saharan Africa, a track record of conducting program administration and field assessments, experience of project management including field teams and excellent communication skills are also needed. Directs the planning, development, and operations of a program. Collaborates with representatives from private, government, and international agencies. Plans, executes, and monitors program budgets, including approval of expenditures; prepares annual financial and program reports to external parties with interests in the program. May engage in fundraising initiatives on behalf of the program. Ensures that the program is in compliance with federal and international laws and regulations. Oversees program communications, including development of communications strategies, development of key program messages, production of print and electronic materials, and reputation management. Represents the program in various national and international fora, and actively engages with representatives from other NGO's for purposes of conducting research and designing new initiatives. Bachelor's degree in field related to specific program as indicated and six years program related experience, or equivalent combination of experience, education, and training. Working under the overall supervision of the Director of the Global Access to Information Program, the Associate Director will support management of one or more projects, with emphasis on the justice and security sector, including strategic direction, design and implementation, budgeting, fundraising, and public relations. Liaises with both Carter Center staff and external clients. Tasks include supporting project development, grant development, budget planning, leading and/or participating in field missions, project/initiative promotion, report production and networking. S/he assists the Director in defining and evaluating the program’s overall mission and strategy, and supervises staff, interns and consultants as assigned by Director. -Ability to travel internationally is required. -Post-graduate degree and a minimum of six (6) years of program related experience or equivalent in international relations, political science, public policy, justice and security, human rights, good governance and/or law. -Experience working with the justice and security sectors. -Strong written and communication skills. -Applicant should be detail-oriented, well-organized, and proactive on follow-up. -Applicant should possess a positive attitude and an excellent sense of humor are essential. -Familiarity with NGOs and project-based fundraising and prior living/working experience abroad is a plus. -Directs the strategic planning, development, and implementation of program. -Collaborates with representatives from private, government, and international agencies. -Represents the program in various national and international fora. -Conducts research, designs new initiatives, writes publishable articles and papers, collaborates with others, and designs programs. Serving as a generalist in support of all aspects of the human resources operations for The Carter Center, the HR Associate, coordinates with various Emory departments to implement human resources processes and ensures consistent application of Emory/Carter Center policies/procedures. The HR Associate will perform established transactional activities for staff of The Carter Center, including employee onboarding and orientation, timekeeping, and recruitment activities. Facilitates the implementation of policies and procedures in compliance with established Carter Center/Emory University guidelines. Interprets and counsels’ managers and employees on policies and procedures to ensure consistency in application. Leads employee training and education on various HR-related topics. Responsible for gathering relevant information for employee relations, occupational injury and FMLA requests. Accountable for the integrity of data in databases, records, and files and prepares ad-hoc and routine reports. The HR team coordinates and executes staff events. This position reports to the Director, Human Resources and serves as the back-up for the Director and may supervise staff, volunteers and/or interns. The successful candidate will be proactive and responsive to the organization’s needs, have exceptional interpersonal skills, strong written and verbal communication skills and the ability to multi-task. The HR Associate is required to have the ability to exercise sound judgment, discretion, and maintain a high degree of confidentiality. International not-for-profit human resources administration experience in a cross-cultural setting is preferred. Prior specialization in recruitment and professional development is a plus. This classification is to be used in departments/schools at Emory University. Administers Human Resources policies and procedures and related forms for a department or a division. Coordinates compliance with organizational policies and procedures. Completes required forms/documents, reviews for accuracy, and processes. Advises or refers individuals to the appropriate staff for guidance on human resources issues. Advises supervisors/managers and prepares required paperwork to process job reclassifications and to establish and post new positions. Assists in creating/updating departmental position descriptions. May assist in preparing and monitoring departmental budgets. Assists in human resources related education/training efforts within the department. Utilizes database management, word processing, spreadsheet and/or other computer applications. Bachelor's degree in human resources, business administration, or a related field and three years of experience in human resources administration or an equivalent combination of experience, education, and training. Under the leadership of former First Lady Rosalynn Carter, a long-standing champion for the rights of people with mental illnesses, the Carter Center's Mental Health Program works to promote awareness about mental health issues, inform public policy, achieve equity for mental health care comparable to other health care, and reduce stigma and discrimination against those with mental illnesses. The Sr. Program Associate is responsible for reviewing, evaluating, and monitoring behavioral health policies and legislation to determine their benefits, flaws, and impacts on behavioral health. This position serves as liaison with stake holders to understand and document needs, concerns, and viewpoints. Incumbent gathers, analyzes, integrates, and reports on quantitative and qualitative data. Serving as a policy analyst, the Sr. Program Associate formulates policy reports that synthesize information, benefit constituents, and display evidence on both the state, national, and international level. This position will provide expertise from the Public Policy area across projects within the Mental Health Program. This position reports to the Program Director for the Mental Health program. The position is in Atlanta, and domestic and international travel is required as needed. Master’s degree in Public Policy, Behavioral Health, or Public Health with at least five years of proven public policy analysis experience in a state, national, or international context is preferred. Designs, implements, coordinates operational facets of a specific program and its related activities. Manages work plans that are designed to accomplish program goals and objectives and implements changes for improvement and efficiency. Makes decisions on behalf of the program based on critical analyses of operational/statistical reports, financial data and budget forecasts, and outside trends and factors related to the program. May plan, administer or monitor the program's budget, financial management, and/or grants. Takes a leadership role on program-related committees and teams. May develop fund raising initiatives, including researching and identifying funding sources and writing and submitting grant proposals. Conducts program research and ensures that mandatory operational and statistical reports are fact-based and comply with regulations. Serves as liaison with other groups and organizations participating in the program or seeking knowledge of the program, and may write and give speeches/presentations at conferences, university functions, or before various boards. Ensures that complete and accurate program records are kept and maintained. Bachelor's degree in a field related to specified program areas and four years related program management experience, or equivalent combination of experience, education, and training. 1. Go to Emory University's Career Opportunities page. 2. Type "Carter Center" into the Search Positions Listing box, then click Search. 3. Browse search results, and click on a position for more details and to Apply Now.